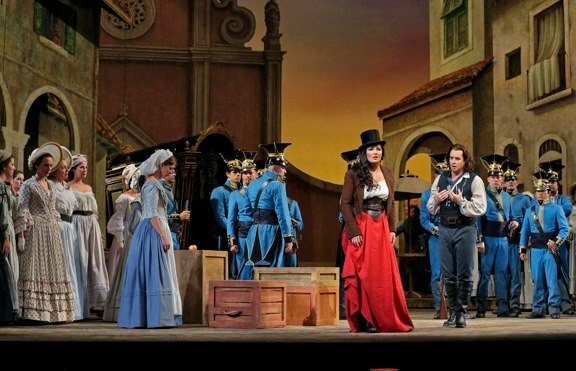 Donizetti's L'Elisir d'Amore is a charming opera: it is coherently and elegantly constructed; it is witty and winsome; its comedic scenarios are laced with a poignancy that makes the development of its characters satisfying. These are all virtues which Bartlett Sher's new production conspicuously lacks. Sher claimed to be inspired by the political upheavals of Italy in the 1830s, but his production resembled nothing so much as a second-rate landscape painting of the same period (with the possible exception of a second-rate opera production of a century later.) Men and women of all ages and walks of life crowd into the square to see Dulcamara's coach, but it is unclear why. Nemorino, who is mocked as being semi-literate, enters the stage reading a book. Adina eats fruit to establish her sensuality. Dulcamara is apparently supplying rifles to the anti-Austrian faction, but his air of bonhomie never alters, and the soldiers are deterred from investigation by a wave of the hand. Belcore and his implausibly immaculate soldiery harass the citizenry in an absent, halfhearted way, interrupting these efforts whenever it comes time to sing a chorus. Nemorino, perhaps for the sake of Romanticism, sings "Una furtiva lagrima" on a heath at dawn. Against this picturesque and pointless backdrop, a fine cast did their best to do the opera justice. Attending a performance of Einstein on the Beach, a work where the importance of subjectivity in its reception is deliberately highlighted, was an exhilarating prospect, but also one that conferred on me a sense of special responsibility. 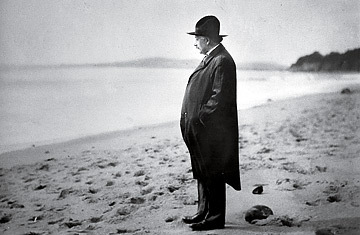 I read scholarly essays and listened to a recording and read the work's texts; in the week preceding the opening of Einstein's run at the Brooklyn Academy of Music, I read pieces in the New Yorker and on BAM's blog. In my reading I found the work defined as minimalist and non-minimalist, modernist and postmodernist; as a work that could barely be counted as an opera, and as a work that redefined the parameters of the genre. Having seen it, I'd be tempted to call it a deliberately disassembled Gesamtkunstwerk (with apologies to Brecht.) This is not to say that it seems disjointed; its episodic structure is given impulsion and an internal logic of sorts by the music, and the intimate connection of the score to the choreography. The work is rich and strange, allusive, mystifying, and hypnotic.